A small investigative study hopes to inspire more research into unprecedented findings that complicate assumptions about trans men's experience and emotions during pregnancy. In a first-of-a-kind study published in Obstetrics and Gynecology this month, researchers set out to determine whether testerone therapy prevented pregnancy and asked trans birth fathers about what it felt like to be male and pregnant, reports NPR. The results were illuminating about the relationship between trans men, their healthcare, their bodies, and their senses-of-self. The study focused on 41 trans men who were currently pregnant or had given birth, and was developed by medical student Alexis Light after she was asked by several trans male friends what pregnancy was like and whether they would be able to conceive after using testosterone, notes NPR. Unable to find an answer in medical literature, Light designed a study with Dr. Jennifer Kerns, an assistant professor of obstetrics, gynecology, and reproductive sciences at the University of California, San Francisco. Drawing on survey results, Kerns, Light, and two other researchers noted patterns in their qualitative data about the daily experience of being pregnant and male. While the respondents described facing the expected discrimination and disbelief, they also addressed the unknowns that Kerns' friends wondered about: Testosterone did not prevent conception for the 25 participants who had undergone hormone treatment, and pregnancy resulted in a wide range of both positive and negative emotions. In terms of social interactions, respondents recalled numerous insensitive comments and exchanges, both in public and in doctor's offices, reports NPR. This included receiving uncomfortable stares, suspicion, hostility, being misgendered, being turned away from prenatal care, and even being reported to Child Protective Services. Kerns explained to NPR that these experiences often resulted in isolation from healthcare and a possible increase in depression during pregnancy and after. Several of the respondents noted that pregnancy spurred a re-emergence of gender dysphoria — discomfort or distress related to a felt difference between one's psychological and physical gender. As one 35-year-old respondent described it: "Heavy time, having a baby, not passing as male. All the changes and a society telling me to just be happy." Yet, according to NPR, researchers found that pregnancy can also lower a trans man's dysphoria, depending on the individual. Several respondents said that becoming pregnant allowed them to feel pleased or comfortable with their bodies, and feel that their bodies were doing something valuable that other male bodies couldn't do. "Pregnancy and childbirth were very male experiences for me," said one 29-year-old respondent. 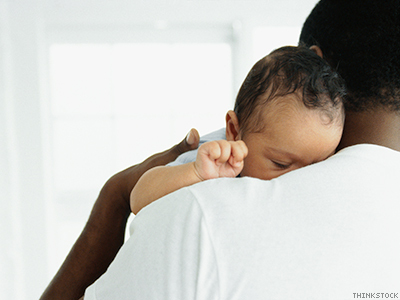 "When I birthed my children, I was born into fatherhood." Light and Kerns are confident that their study will be helpful to providers looking for pointers on how to relate to their pregnant male patients. However, they emphasize that because of their small sample size, their results are not definitive and should be replicated by other researchers. They were unable to ascertain how many men have tried and failed to become pregnant, and were only able to estimate how many men become pregnant each year — a number that, as Kerns speculated to NPR, could "easily" be in the thousands.